Inverlochy Castle is located amidst the scenic foothills of Ben Nevis overlooking its own loch. Built in 1863 by the first Lord Abinger, the castle was a private residence until 1963. Queen Victoria herself visited in 1873 and commented in her diaries ‘I never saw a lovelier or more romantic spot’. Nowadays, the Castle is a luxury hotel that offers you high-end accommodation with 17 bedrooms, individually designed and all with private bathrooms. Living the traditional Scottish experiences, the grand hall is the perfect place for tea-time or for a pre-dinner cocktail. high gastronomy is also part of this complete service, enjoying Michelin star dining in 3 wealthy room. There is plenty to do from scenic walks around the stunning grounds to clay pigeon shooting and fishing on the loch. 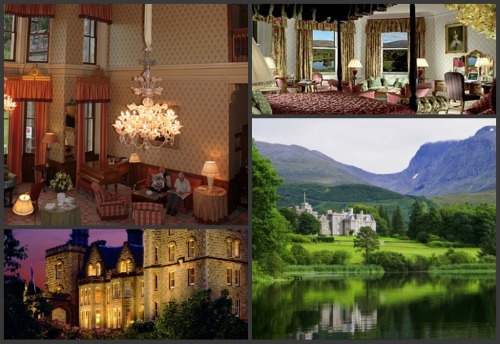 Whether you like to enjoy of a romantic weekend or just to discover and to feel « the Royal Tradition » Inverlochy Castle and its Scottish environment are waiting for you!